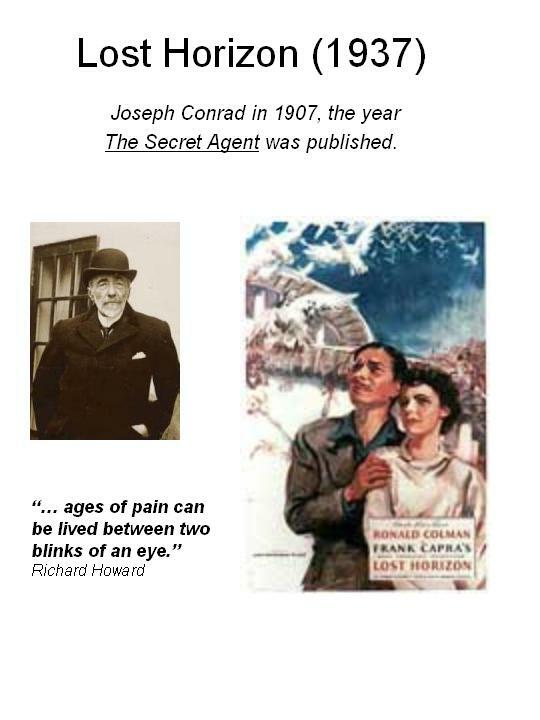 Though these texts are marvelously inventive, in setting them I worried about how to engage the listener who had never seen (or didn’t remember) these movies; how much of Howard’s poem would be understood, especially when his words are not read to oneself but sung, and sung at a rate determined not by the listener but by the composer and conductor? Since what the Masters have to say will likely give more pleasure to the listener familiar with the movies on which they comment, I decided to assign lines of dialogue strategically to a small group of chorus members who, in some sense, are asked to “play” the movie characters. These lines are intended to jog the memory of a listener who has seen these movies, and to tell the movie’s story in as few words as possible to those who have not. The piece, then, is divided into three overlapping sonic layers: the three Masters (James, Conrad, Cather) as soloists; the small group of actors; the chorus. And since my work for voices is often shaped as much by the sound of a word as by its meaning, I have assigned an unusually complex role to the chorus. They must not just incorporate the personalities of the masters and movie characters; it is up to them to convey, with words and the sound of words, such non-semantic entities as state of mind, foreboding, sense of time, or memory. In short, they take on the role of the orchestra in an opera; without them the characters are vacant, the drama non-existent. The Masters on the Movies was commissioned in 2006 by Hobart and William Smith Colleges for their extraordinary chamber chorus, Cantori. The group is directed by the incomparable Robert Cowles. 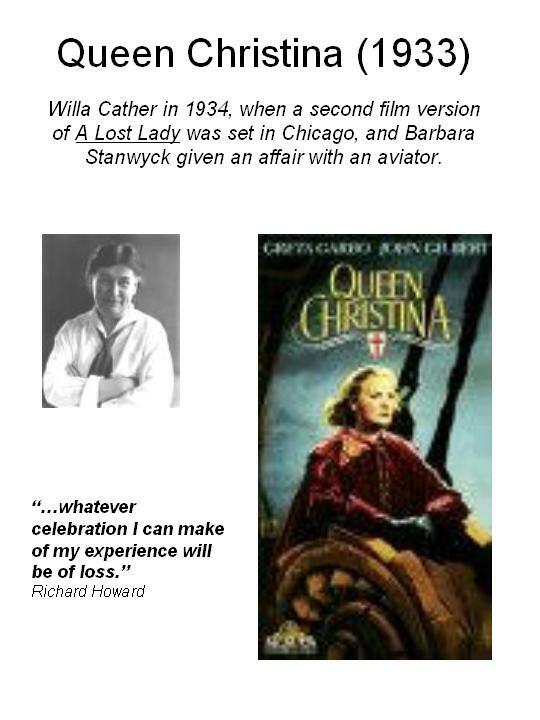 In 1934 a second movie version of Willa Cather’s novel A Lost Lady was released (the first was made ten years earlier) and Cather, after seeing it, is reputed to have forbidden any more sale of her work to Hollywood. The movie tells the tale, effective in its own terms, of a queen whose love for a foreigner is so unpopular with her xenophobic subjects that she is forced to abdicate. But poet Howard creates a Cather impatient with dumbed-down screenplays, and her warm reaction to arguably Garbo’s best performance as the Swedish queen is overpowered by her annoyance that the movie avoids all matters of Christina’s impressive accomplishments, such as her friendship with Descartes, or any of her astute political decisions. (Cather’s line “I am and ever shall be / emulous of the young queen’s embracing / a practice so much in accord with her / aspirations (and her accomplishments)” becomes the central and recurring musical motive of the piece.) Howard’s Cather, who confesses that her “own imaginative knowledge is of loss, / the consequent action of what I write / is of loss as well,” finds a “grain of truth in one moment:” the movie’s most famous scene where Garbo, eyes closed and arms stretched out as if she were blind, tries to memorize the quaint, rustic room she has shared with her doomed lover Don Antonio.